My game is about jumping between rocks and playing in a shallow man-made brook, because it's something fun I remember doing as a kid. The setting is sort of like a reconstruction of what I remember, although the walls of the brook are much higher so that the camera doesn't smash through the bridges that cross overhead. The player is a frog tadpole humanoid creature because i wanted a nonhuman character that still feels like a person in some way. I liked making something small that didn't have too many things about. 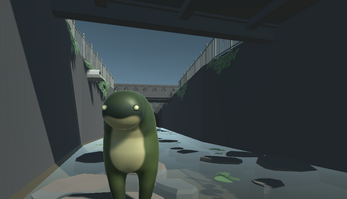 I think the way the tadpole character falls over is funny, and coding that was fun too. Figuring out how I wanted to have the game look was tough, because I've never done 3D visual design of this type before.